The other day, I told you that I read "Ms.Koizume, who is crazy for Ramen" and I went to "Tenka-Ippin Ramen". In this time, I went to a Ramen shop that Ms.Koizumi recommend for me. The name of Ramen-shop is "Mouko-Tanmen Nakamoto". The day before yesterday, I went to the shop in Shinagawa area, when I was on business trip to Akihabara. I asked a waiter for a spicy Ramen, he recommended me a kind of Ramen. I am a subordinate to reserve the Indian restaurant as a Years-End party place, thought my boss dislikes any spicy foods. and, I am an engineer who put words into Chinese engineer's mouth, "You won"
"Mr.Ebata, who is crazy for hot"
I was thrilled to have a ramen. It was highly ridiculous that this was the hottest ramen. With letting me down and seeing the menu, this was not the hottest one. I couldn't help it, I did with the ramen, and went back to my office. But I don't want to change the cover at all. "The animal's chat" is wonderful works, and the cover's colors are also beautiful. I think that this is the best cover. I hope to continues to drawing the cover. So, this is MY problem. I tried to come to think where to take down about this contradiction. (1)To buy it in Amazon, or to give my daughter money to buy it. This comic is covered by the Amazon prime (a sort of free delivery service), this is a certain method. However, I am afraid that I feel joyless if I lose a sudden encounter at a convenience store and a bookstore. (2)To ask the publish company about the cover for men. However, the publishing company cannot make such a budget. I also think that "giving the readers up" is correct. (3)To stop reading it, or endure the pain. I think this is a realistic solution. "What a stupid saying Ebata did, in the period of "the electronic books"
But the electric books are difficult for me, because I read more than ten books at the same time on my desk. So I absolutely want to resolve this problem as old styles. "For the final stage of EtherCAT serialisation, I am preparing for these cable and devices, in order to install the home security system on the Ebata's house." 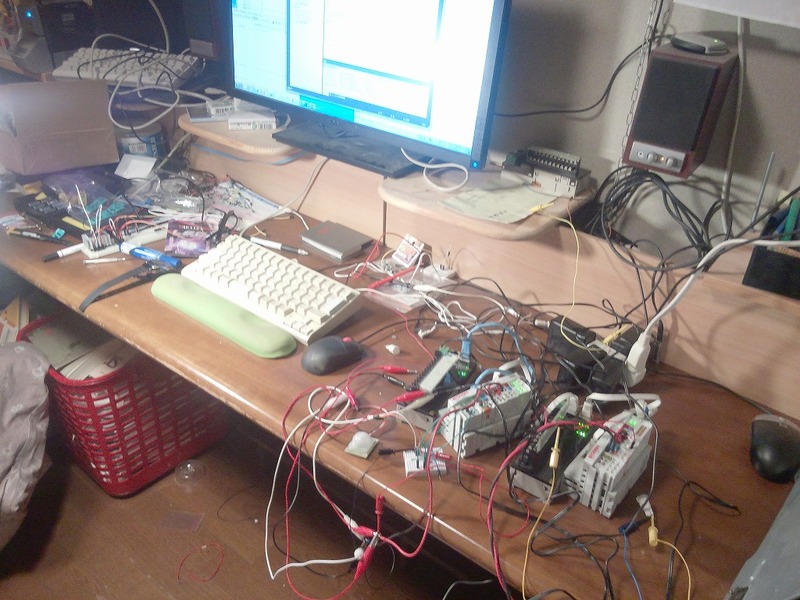 I am going to open a picture of "battle field" where "EtherCAT Master", "EtherCAT slave", many types of sensor and I fought mutually. Never make a image of "Ebata writes manuscripts every weekends elegantly"
Up to this day, I have had a lot of boss in the company, however, I don't remember that I had received a good advice from the boss. The reason that I obey boss, I am not clear about the boss's intention, but I think that the attitude is one of the best way to finish my work soon. (1)Even a boss doesn't know all kinds of method to do a work, so it cannot be helped that he/she feels anxious about a work of their subordinates. (1)On the other hand, the subordinate just knows their own method to do a work, so it cannot be helped that he/she feels pains from the boss's order. On this stage, the relationship between a boss and a subordinate seems to be even. (3)The method that they have done before, is the best cost-performance and reasonable strategy. Because the method is that they have done before. Assuming that the above, the way to break this balance is to use an instructions in the course of employment. The conclusion is also clear. "Subordinates should accept the pain and unreason. There is no way except for the above sentence. I do not remember "When I was on dating, I had a problem with topics". It might just be "no memory", and moreover, the number of dates of mine, might be also very small. It happened to have been so. "Why can you talk so much in the middle of the night, after you worked harder and tired in your company?" Even if she says "Why", I do not understand well either. The reason might be, I work quietly at my office. or laboratory alone all day. Nevertheless, as an engineer of information systems, I come to get angry with conversations that do not utilize the communication resources. There was a young lady speaking by smart-phone in a conversation mode, in a Yokohama municipal subway train. The voice of a man, heard from a smart-phone probably was her lover. Male: "Hey, where are you now?" Female: "Where do you think it is?" Male: "Yeah, I do not know at all. Where are you? " Female: "Where am I (with smiling)?" "It is a point about 20 seconds remaining until the municipal subway Shonan-dai. She will get off soon!" "Do not crush precious communication resources (frequency channel, communication band) with conversation with zero information!"